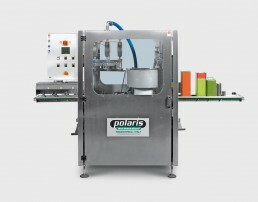 Polaris Automazioni designed the B500 line for producers of oil who want to automate their bottling cycle also for metal tins. Capable of handling various sizes of tins: cylindrical, square, rectangular, from 150 ml to the traditional 3 L and 5 L sizes. Size changeover involves just a few simple adjustments and without having to change machine parts, in just 5-10 minutes. The nominal production capacity is 300 pcs/hours for the 5 L size and up to 500 pcs /hour for smaller sizes. It is a one-piece machine made entirely in AISI 304 stainless steel. FILLING MACHINE Electronic filling unit with 3 valves and mass-type flow meters (specially calibrated litre-counters to measure the volume of the bottled product). Each unit has two valves both open during the initial filling phase. When approximately 200 grams are needed to reach the total weight, one valves shuts off and reduces the filling speed by 90%, thus offering the possibility to top-up the tin. The degree of filling accuracy is 0.3 grams per kilogram. The filling head does not come into contact with the can. The filling speed is adjusted by the inverter controlling the single-screw pump. CAPPER Capping unit for press-on plastic caps with feeder hopper. ACCIDENT-PREVENTION GUARDS CE standard accident-prevention guards with top cover (air treatment option with slight over-pressure for filling in controlled environment). PRODUCT INFEED Product supplied by single-screw pump included in the line. ELECTRIC CONTROL PANEL with Profinet and SIEMENS S7 PLC, HMI touch-screen operator panel. The correct filling parameters (identified during the testing stage) are stored in the PLC so they can be rapidly called up on the HMI panel whenever there is a size changeover. FINAL COLLECTION TABLE Final collection table for the finished product. The B500 line can be customised and its configuration always matches the specific bottling and packaging needs of the user, adding or removing different heads as required. Other containers in similar sizes to a tin and with press-on caps can be filled with different materials. Should the diameter of their filling mouth be much less than the tin, the drain pipe of the three filling units can be replaced with others of an appropriate size. Feeder hoppers for different sizes of caps. Ink-jet printing managed by the line's PLC, for direct printing onto the tins.